Ever look at something and find it so beautiful or fascinating that it just sort of sticks with you? Perhaps it gives you a gut feeling that it speaks to something you’re working on? Then, maybe in the shower the next day, it hits you? That’s what happened to me a while ago when our Intercultural Competence News Feed curated Dr. Gary Greenberg’s photos, taken through a microscope, of grains of sand. 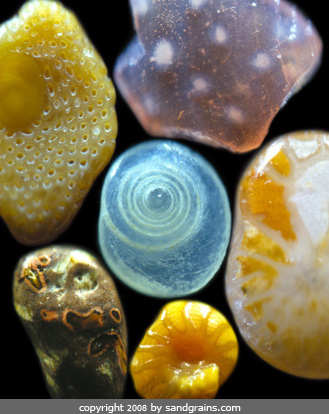 While most of us normally think of grains of sand as looking fairly similar — tan or brown, some crystals, shiny — Gary’s photos show us that deep down, once we “get to know” the grains of sand, so to speak, each of them is quite unique! Now if that isn’t a metaphor for diversity, inclusion and cultural differences, what is? We hope you’ll be pleased with the train of thought Dr. Greenberg’s gorgeous photos produced. We put together a PowerPoint on cross-cultural dynamics that you are most welcome to download and use. It hasn’t been polished and perfected like the grains of sand, but if you read the presenter notes, we are confident you’ll have fun customizing the ppt for your programs. We all have favorite photos, metaphors, comics, and stories, or even video clips, that we love to use in teaching, training and coaching. If you have something you would be willing to share, please pass it on. We’ll be happy to get it out there for you and link through to your website or contact information. Together we can build a more respectful, understanding and collaborative world! This entry was posted in Downloads/free gift, Exercise/activity and tagged Cross-cultural communication, cross-cultural skills, Cultural Detective, diversity and inclusion, Education and Training, global business effectiveness, global diversity, intercultural competence, multicultural society, Sand, stereotypes by Dianne Hofner Saphiere. Bookmark the permalink.